КупитьThe t.bone по лучшей цене и бесплатной доставкой по Санкт-Петербургу. 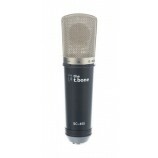 USB studio condenser microphone With USB port for direct operation on the computer Polar pattern: Supercardioid Frequency range: 20 - 18,000 Hz Max. SPL: 134 dB Field transmission factor: -13.3 (dB re 1V / Pa) Compatible with Windows 2000 / XP / Vista / Win7 ..
Large diaphragm studio microphone USB port for direct operation on the computer No additional drivers needed Phantom power via USB Port Characteristics: Wide Cardioid Frequency range: 20 - 18.000 Hz External Low Cut and -10 dB Pad Switch Compatible with..
Large Diaphragm Studio Condenser Microphone 1" Gold diaphragm Polar pattern: supercardioid Frequency range: 20 - 20000 Hz Sensitivity: 23.3 mV/Pa Output impedance: 200 Ohm SPL: 132 dB Internal low-cut switch at 100 Hz with 6 dB +48 V phantom power.. 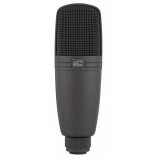 Studio Condenser Microphone Pattern: Supercardioid Frequency response: 40 Hz -18,000 Sensitivity: -35 dBV / pa (22.4 mv / pa) Impedance: 200 Ohms Max. SPL: 122 dB (THD less than or equal to 1% 1000 Hz) Phantom power: 15-52 V Length x max. 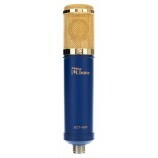 diameter: 170 ..
Large-Diaphragm Tube Microphone 1.07" Gold membrane Super warm sound Directional characteristic: Cardioid Frequency profile: 20 / 20,000 Hz Output Impedance: 200 Ohm Sensitivity: 36 +/- 2 dB (0 dB-1V/Pa 1000 Hz) Incl. 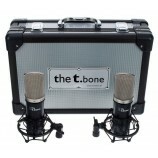 transport case, windscreen, shock m..
Large Diaphragm Studio Microphone Through the 1.07" double-diaphragm, switchable polar patterns (omnidirectional, cardioid, figure eight) and high-pass filter, SC1100 suitable for all studio applications. Switchable d polar pattern: omnidirectional, cardioid and figure eight Low..
Large diaphragm studio microphone Cardioid and omnidirectional 1" Gold diaphragm Frequency response 30 Hz - 20 Khz Impedance: 200 Ohm SPL 138 dB Low cut switch at 100 Hz with 6 db Requires 48V of phantom power Incl. 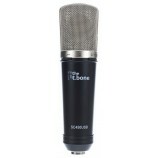 shock mount and bag ..
Large-Diaphragm Tube Microphone "Warm tube sound for digital recording!" 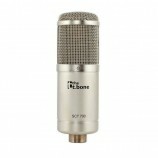 - With the SCT 800 t.bone reacts to the cries of countless projects and also professional studios and provides a condenser microphone for an almost unbeatable price. It consists of a gold-steamed diaphragm and a reliable.. 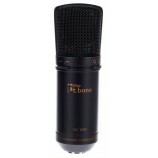 Studio Tube Large Diaphragm MicrophoneThe flag ship of the t.bone large diaphragm microphone series. On the external power supply it has a 9-way polar pattern toggle switch which allows the user to choose between the standard omnidirectional, cardioid and figure 8 (bidirectional) and the particul.. 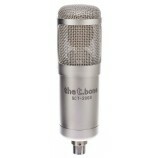 Stereo Set With the SC450 the t.bone has brought in the market a large diaphragm microphone at an amazing price. 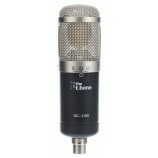 New standard for professional and project recording studios for a remarkable price. 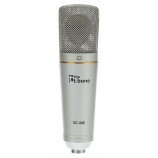 The SC450 uses 6 micron, gold plated diaphragm (1") for a transparent and clear sound, wide dyna.. 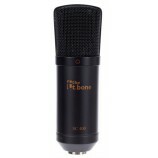 Studio Large Diaphragm MicrophoneWith the SC450 the t.bone offers a large diaphragm microphone at an amazing price. The SC450 uses a 6 µm, gold-plated diaphragm (1") for a transparent and clear sound, big dynamic range and a wide frequency response. The -10 dB and low cut filter switch offers ver..